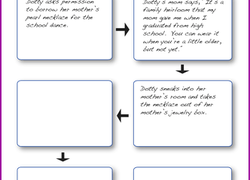 Use this graphic organizer to help students plan their personal narratives by drawing what will happen. Thinking about the beginning, middle, and end of their narratives encourages young writers to stretch out the small moments they write about. No more abrupt “The End”s! Students will organise and reflect on their narrative’s problem and solution as they work toward a strong ending. Assess your students’ use of sequencing and paragraph structure in their writing.